Kindergarten through 4th grade students enjoy the opportunity to participate in an after-school enrichment program called “Culture Club.” A series of weekly classes are offered several times throughout the year by our Spanish teacher, Mrs. Allyson Stanz. The club exposes students to the Spanish culture, including its language, customs, foods, and music. Students at St. John’s begin formal instruction in Spanish beginning in 4th grade. By 8th grade, many of our students are so proficient that they are able to by-pass the first year of Spanish when entering high school, which ultimately allows them to earn college credit for foreign language before they graduate. This introductory program provides students a head start in acquiring the Spanish language. Culture Club endeavors to instill a curiosity to foreign languages and to develop students’ ability to differentiate between the various sight and sounds of words, etc. Culture Club is offered throughout the year at a nominal cost and the enthusiasm bellowing from the classroom is contagious! The talents of Mrs. Stanz make learning “mucho” fun! Students in grades 5 to 8 journey to the south-towns en route to the snow-capped hills of Kissing Bridge. Our ski club travels by chartered bus every Friday afternoon during January through March to hit the slopes with their skis and snowboards, weather permitting. Parents chaperone our students and return the crew home each week around 11:00 pm. Equipment rentals available through Kissing Bridge. Over a period of 10-12 weeks beginning in March, girls in Grades 3-5 participate in an after-school program designed to recognize and to celebrate their inner strength. The Girls on the Run lessons encourage positive emotion, social, mental, and physical development. 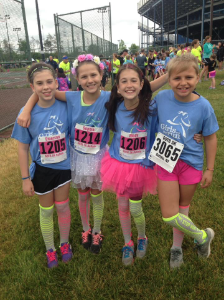 At the end of each three month session, the girls participate in a Girls on the Run 5K Event!